Has Japan's Long Bull Market Come to an End? 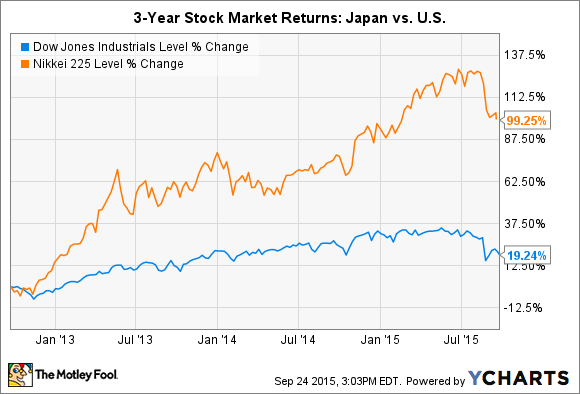 The stock market in Japan has corrected more than the Dow. Find out why. The correction in the Dow Jones Industrials (DJINDICES:^DJI) has made many U.S. investors nervous about whether the long bull market is finally coming to an end. For international investors, though, the question is whether overseas markets are at even greater risk of a big decline. In particular, after two years of much stronger performance than the Dow Jones Industrials, Japan's Nikkei 225 (NIKKEIINDICES:^NI225) has lost almost 15% of its value since mid-August, including a nearly 500-point drop for the index overnight on Thursday. For those invested in Japanese stocks, the biggest fear is whether an end to Japan's outperformance could come sooner rather than later and take a big bite out of their long-term returns. The Nikkei has definitely had the upper hand on the Dow over the past few years. As you can see in the chart below, Japan's key benchmark has nearly doubled since late 2012, while the Dow has made do with about a 20% gain. A huge amount of the relative gains in Japan have come from the strength in the U.S. dollar. Indeed, when you take a look at dollar-denominated measures of the Japanese stock market, you can see most of the outperformance evaporate. The iShares MSCI Japan ETF (NYSEMKT:EWJ), for example, is up just 20% over the past two years, reflecting the fact that the dollar has climbed from about 80 yen to as much as 125 yen. The dollar's influence has had a fundamentally positive impact on many Japanese businesses. Exporters in particular have benefited from the weak yen, as they've been able to sell their goods overseas and translate their foreign-currency profits into a larger amount of local currency. The Japanese government has also made efforts to stimulate growth, with a combination of factors that include quantitative-easing-based asset purchases from the Bank of Japan and moves from Prime Minister Shinzo Abe to try to end the deflationary spiral that has held the island nation back for the past quarter-century. Still, Japan has had to deal with challenges as well. A new consumption tax threatened economic growth when it was implemented last year, taking money out of consumers' pockets and stifling spending. More recently, Abe has had to update his economic plan with more aggressive strategies, including a push toward encouraging population growth, cutting corporate taxes to spur greater industrial growth, and looking to strengthen the nation's Social Security programs. Moreover, it's increasingly unclear whether the global quantitative easing experiment has actually been successful. Throughout Europe and Asia, various efforts to control interest rates have had only mixed results, and even the relative success of the U.S. hasn't led to unambiguous economic health. The Federal Reserve's reluctance to raise interest rates even slightly highlights the vulnerability of the market even here. Finally, China has played a vital role in economic prospects throughout the Asia-Pacific region. As growth in the Chinese economy has decelerated, Japanese companies have started to lose a key source of demand, and if the emerging market is facing the prospect of having to accept economic expansion at a permanently slower rate, then Japan will have to adjust as well. Japan faces many of the same challenges that the U.S. does, and dealing with them will be equally difficult. If its efforts succeed, though, then Japan's long bull market might yet have further to run despite its recent steep downturn.